Beat or whisk together the eggs, butter and a teaspoon of sugar until foamy. Mix the flour with the baking powder and gradually add to the egg mixture. Work the mixture into a soft dough with your hands. Adjust the consistency with flour or melted butter. Divide dough into 4 or 5 workable sections and roll each piece on a floured surface into a “rope” about ½ inch thick. Cut the “ropes” into 1 inch pieces. With floured hands, roll each piece to form it into a ball. Toss the balls with enough flour to coat very lightly. In a small sauce pan filled with oil fry the balls. Don’t overcrowd the pan. Fry until browned and puffed. Transfer to absorbent paper toweling to drain. In a sauce pan, mix the honey, orange rind and ½ cup of sugar. Cook slowly until sugar melts. Add the fried, drained balls a few at a time to coat each ball with the honey mixture. Transfer the balls to a large plate. Stack the balls, as they are coated, into a pyramid shape. Use wet hands to shape the pyramid. This is a traditional Easter treat. 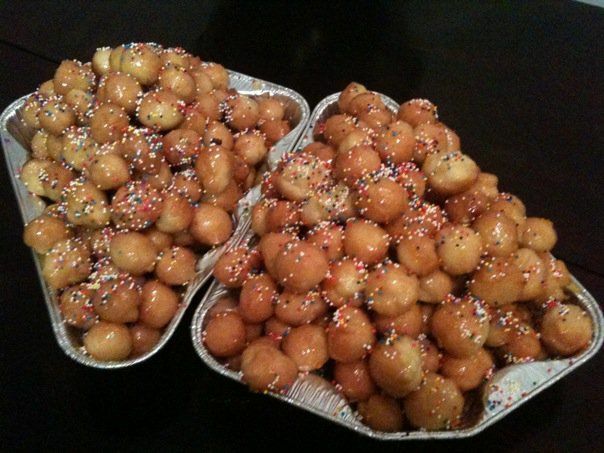 Every home on our block had a huge plate of Struffoli within easy reach of any guest. (Mostly kids running from house to house getting our fill!) Each home a little variation to it. Some sprinkled the finished pyramid with tiny colored candies or sprinkles. Our home left them plain. Reach into the plate and pick off a few of the fried morsels. Adults and kids alike both licked their fingers to get the last of the honey coating.